We had arrived in China at just about the same time as Typhoon Utor. Which was a bit of a problem, since our cameraman Damien Riunaud and I had travelled to Shenzhen to board the Singapore-bound APL Boston container ship and produce video footage documenting life at sea. The trip was meant to coincide with the coming into force of the ILO’s Maritime Labour Convention (MLC, 2006), also known as the Seafarers’ Bill of Rights. A milestone in maritime history, the Convention sets minimum standards aimed at ensuring decent working conditions for seafarers, while helping to provide a level playing field for quality shipowners. It came into force on 20, August 2013. When the port of Chiwan, just outside Shenzhen, finally re-opened, the state of the art APL Boston was there in all her might, all 328 meters of it. Boarding the vessel, I tried to picture the amount of goods it carries around the globe – I bet half of what we have in our homes has been shipped in such vessels. And yet, we know little, if anything of the thousands of people who spend their lives at sea and whose work keeps the world’s shipping afloat. One of the first things that struck me was the calm the 28 crew members exude, despite the pressure and stress of the job. And there certainly was plenty to do for the crew as the ship’s cargo of containers was being unloaded. The next step, moving about a mile to another loading dock, took about one hour. The port pilots and the ship’s crew achieved what looked to me like a geometrically perfect berthing. Loading and unloading took the better part of 48 hours. I couldn’t help but think that some of the goods might end up at my neighbourhood store. Eventually, the cranes went silent, giving way to strident sirens that signaled our imminent departure. Sailing through the bustling Hong-Kong Bay was an amazing experience: crossing under huge bridges with just metres to spare, passing an astonishing array of ships, from flimsy fishing boats, to ferries and enormous cargo vessels. Watching the crew at work from the bridge is a unique experience. The words “meticulous” and “well-choreographed” come to mind. Each crew member knows exactly what to do and responds rapidly to the captain’s instructions. Has your country ratified the Maritime Labour Convention? During the voyage, we got to know the crew members and find out a little about their lives and their work. And their stories are fascinating. 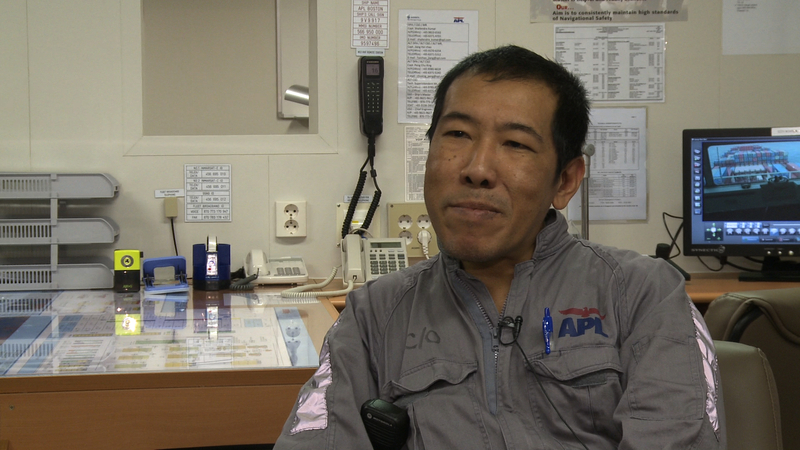 Take Chief Officer Lin Naing Oo, from Myanmar, who calls himself “the balance guy.” One of his main responsibilities is to ensure the proper distribution of weight on the vessel, which is the key to safety in shallow water and optimizes a ship’s performance. Lin, who has been a seafarer for over two decades, explains how higher fuel prices have lead to a focus on fuel efficiency. A note of nostalgia tinged his voice, as he recalled the old days when he’d spend hours writing a letter to his wife and children, which would be posted at the next port of call. There was also more socializing on board, then. Those not on shift would gather to chat, play music and play cards. Now, they tend to stay in their cabins, using their computers. He did admit, though, that it’s much easier to be in touch with family and friends, now that there’s Wi-Fi on board. He’s grateful for all the improvements that took place in the industry over the years. And he’s glad he’s working for a large, partly state controlled company. He told me that in some small companies, seafarers risk not being paid, live in poor conditions and may be exposed to hazards. Lin has strong praise for the MLC, which aims at improving seafarers’ rights to decent working conditions. Lin has strong praise for the MLC, which he believes is particularly important for fellow seafarers around the world who lack decent working and living conditions. This entry was posted in ILO posts and tagged jobs, Maritime Labour Convention, MLC, seafarers, training by ILO Blog. Bookmark the permalink. I think there is a minor fault in your report. Chief engineer should be chief officer, as he is responsible for the distribution of the weight (cargo and ballastwater). This is a typical bridge job. Besides that, his coverall is marked with “C/O”. It’s always good to see some office guys who go to sea and experience how life is over there. i’m sorry to highlight that its “chief officer” who is the one taking care of proper distribution of weights!! Many thanks for your comments. We have updated the blog–looking forward to more feedback!